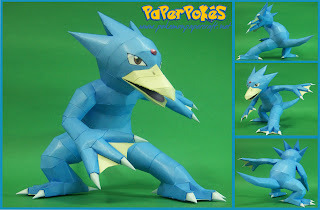 Interesting Facts: It has been noted that Golduck will often join swimmers when training. They are sometimes found rescuing people lost at sea from danger, their heads shimmering from the telekinetic powers that allow them do so. The headaches that ridiculed its Basic evolution form, Psyduck, don’t trouble Golduck, allowing them to have full use of their formidable mental powers. NOTES: Start at the head and close at the tail. Be careful with the head spikes and the hands and feet, the webbed details can be glued by a drop of glue on the sides or superglue. Further instructions on the template. Yup, sorry about that, link fixed now. Nice work ,how much pieces have this model? I just finished this model, thank you! Only 1 day before this was posted, I saw the episode "Bye Bye Psyduck" and wanted to make a Golduck papercraft. The only one I could find was grey, not blue. And the next day...Tada!